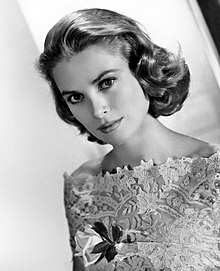 Hahnemann University Hospital, Philadelphia, Pennsylvanie, U.S.
Grace Patricia Kelly (12 November 1929 – 14 September 1982) wis an American actress wha acame Princess o Monaco efter mairyin Prince Rainier III, in Aprile 1956. Efter embaurkin on an actin career in 1950, whan she wis 20, Kelly appeared in New York Ceety theatrical productions an mair than 40 episodes o live drama productions braidcast during the early 1950s Gowden Age o Televeesion. In October 1953, she gained starndom frae her performance in director John Ford's film Mogambo starnin Clark Gable an Ava Gardner, that wan her a Gowden Globe Awaird an an Academy Awaird nomination in 1954. Subsequently, she haed leadin roles in five films, includin The Country Girl (1954) wi Bing Crosby, for that her deglamorised performance earned her an Academy Awaird for Best Actress. Ither films include High Noon (1952), wi Gary Cooper; High Society (1956), wi Bing Crosby an Frank Sinatra; an three Alfred Hitchcock films: Dial M for Murder (1954), wi Ray Milland; Rear Window (1954), wi James Stewart; To Catch a Thief (1955), wi Cary Grant. Kelly reteert frae actin at the age o 26 tae mairy Rainier, an begoud her duties as Princess o Monaco. Thay had three childer: Caroline, Albert, an Stéphanie. Kelly retained her airtin tae America bi her dual U.S. an Monégasque ceetizenship. Princess Grace dee'd at Monaco Hospital on 14 September 1982, succumbin tae injures susteened in a traffeck collision the day afore. Efter her daith the French physeecians treatin her reportit that a CAT scan hawd revealed she haed suffered twa harn hemorrhages. The first occurred prior tae the crash, an is believed tae hae been the incitin incident that led tae the crash. The seicont, she suffered while in hospital, is believed tae hae been the result o pheesical trauma sustained in the crash. At the time o her daith, she wis 52 years auld. She is leetit 13t amang the American Film Institute's 25 Greatest Female Stars o Clessical Hollywood Cinema. ↑ "1954 Academy Awards: Winners and History". AMC Filmsite. ↑ Buchwald, Art (April 17, 1956). "Grace Kelly Can Retain American Citizenship: Status of Pat Poodle Oliver Not So Clear; His Marriage Could Start Monaco Squabble". Los Angeles Times. ↑ Robinson, Jeffery (Oct 23, 1989). "Princess Grace`s Fatal Crash: Her Daughter`s Account". Chicago Tribune. ↑ Profile Archived Julie 7, 2011[Date mismatch], at the Wayback Machine. This page wis last eeditit on 18 Januar 2019, at 06:07.